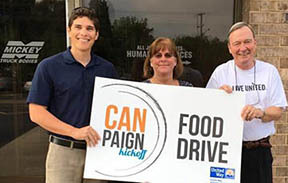 Mickey’s Matt Sink (left) and Gail Wells and United Way Board member Ken Smith celebrate a successful United Way Food Campaign. The Mickey Team donated 10 large boxes of food. Mickey is among the Triad region’s most generous contributors to the annual United Way Program.